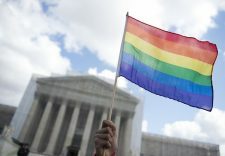 Judges who are elected to state supreme courts are generally less supportive of LGBT rights claims than judges who are appointed, according to new research commissioned by a nonprofit law group. A report released on Wednesday analyzed 127 rulings in state high courts involving LGBT rights claims to understand the impact of judicial selection processes on such cases. The study, produced by Lambda Legal, found that judges chosen through partisan elections are least supportive of LGBT rights claims compared to their peers around the country who are selected through other methods. Lambda Legal is a non-profit that advocates for the civil rights of lesbian, gay, bisexual and transgender people and those with HIV through litigation and other work.